Ahhh, summer, where the days are longer and hotter, the evenings are spent outdoors, and best of all, the BBQ! Today, I have a special recipe I’d like to review with all of you: Ricardo’s Grilled Chicken with Fennel and Apricots. Disclosure: I have been provided with a complimentary subscription to Ricardo Magazine for this review. I have not received any monetary compensation for this review. Views and opinions expressed in this post are entirely my own. It’s so easy to appreciate everything associated with summer: the relaxed pace, the anticipation of well deserved vacations, the abundance of farmer’s markets, and the BBQ! So fire it up because we have some serious grilling to take care of, and it’s going to take the shape of chicken, fennel and apricots. The whole process starts with crushing some spices together; I used a mortar and pestle for this step. Fair warning: grinding fennel, coriander and peppercorns together gives you a to-die-for smell. Try not to waste too much time with your nose in your bowl! If you don’t have a mortar and pestle, no problem – you can always use your coffee/pepper grinder. A meat pounder also works, and as a last resort, there is always the rolling pin. Creativity in the kitchen is not only limited to the food in the recipes! The next step involves the chicken. Although the original recipe will call for all parts of an entire chicken, feel free to make this recipe with just chicken legs or breasts. Whatever works for you! Rub your chicken pieces with olive oil, and then cover your chicken with the spice mixture, both over and under the skin. That last trick was one my mom taught me – putting some of your spice rub just underneath the skin really elevates the flavor of the final product. You can season with salt at this point, but just remember that a little salt goes a long way! In my eyes, the star of this recipe is the fennel. Growing up Italian meant that sliced raw fennel would always make an appearance at the end of a meal; there was a firm belief that it would help with the digestion. I have yet to find a study confirming this, but I do know that I love fennel. I love it raw and I love it cooked. For those that don’t really care for the anise flavor of raw fennel, note that cooking it significantly sweetens it. And with grilled fennel, well, you are just elevating the whole taste experience to a whole other level! Now that you’ve got the chicken and the fennel, get grilling! A quick glance at the recipe will indicate that the apricots are added raw to the final plating of the recipe. I decided to grill them for about 5 minutes. I just love the taste of the caramelized sugars in fruits. I decided to use 1 teaspoon of olive oil and combine it with only 2 tablespoons of the honey (hubbie is not too crazy about eating sweet meats). I basically just basted my apricot quarters before placing on the grill. 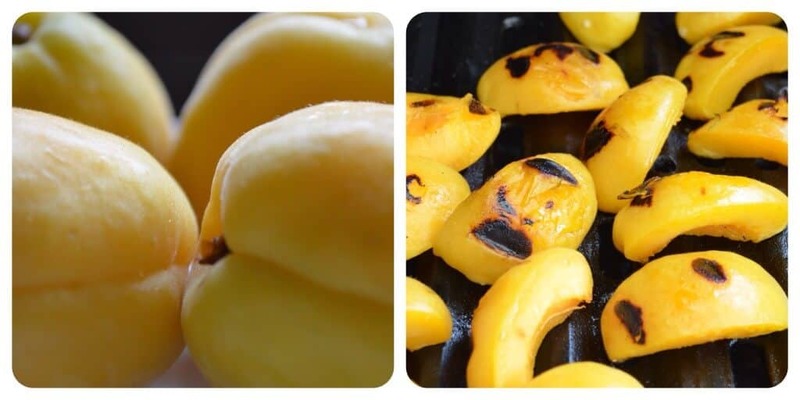 POST UPDATE: I have been making this recipe on a weekly basis ever since I have shared it with all of you… I have since replaced the apricots with peaches. My family prefers this flavor combination with the chicken. I will almost always grill a few extra peaches in order to make this recipe for Honey Almond Ricotta Stuffed Grilled Peaches. Feel free to use either the apricots or the peaches in this recipe. Once I pulled everything off the grill, I brushed the rest of the honey-olive oil glaze over the top. Finally, the recipe for Grilled Chicken with Fennel and Apricots calls for a final squirt of lime juice and a generous topping of the fennel fronds and chives. Voilà…dinner is served! So with only 20 minutes of prep time and about 30 minutes of grilling time your meal is ready. The final product produces the juiciest chicken, with a perfect balance of sweet and savory. Since it was such a hit with my family, I will definitely be making this recipe again and again…at least until the end of summer! Great-tasting and economical, Ricardo’s Grilled Chicken with Fennel and Apricots is definitely a keeper. A few weeks ago, I received an e-mail from a staff member at Ricardo Cuisine inviting me to review a recipe, any recipe of my choice. Well, this was an offer that I simply could not resist. You will find the original recipe for Grilled Chicken with Fennel and Apricots here. As I mentioned, I love fennel and so as soon as I saw the recipe for Ricardo’s Grilled Chicken with Fennel and Apricots, I knew what I had to do. As I have previously mentioned, I have made some modifications to the Ricardo’s recipe. I’d love to hear if you had a chance to try the recipe. Until then, have fun grilling that chicken and enjoy your summer! 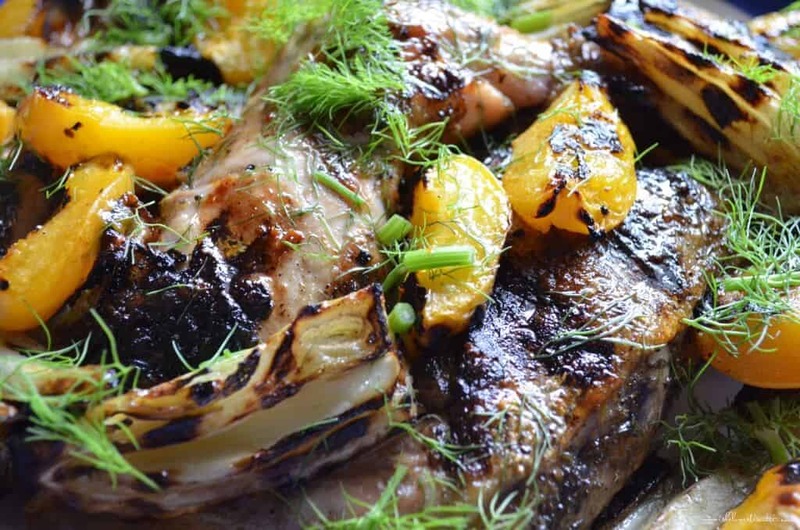 There's some awesome stuff happening at Ricardo Cuisine & this recipe for Grilled Chicken with Fennel & Apricots is just one reason for you to check it out! Preheat your indoor or outdoor grill. Set temperature to high, make sure to oil the grates of your grill. 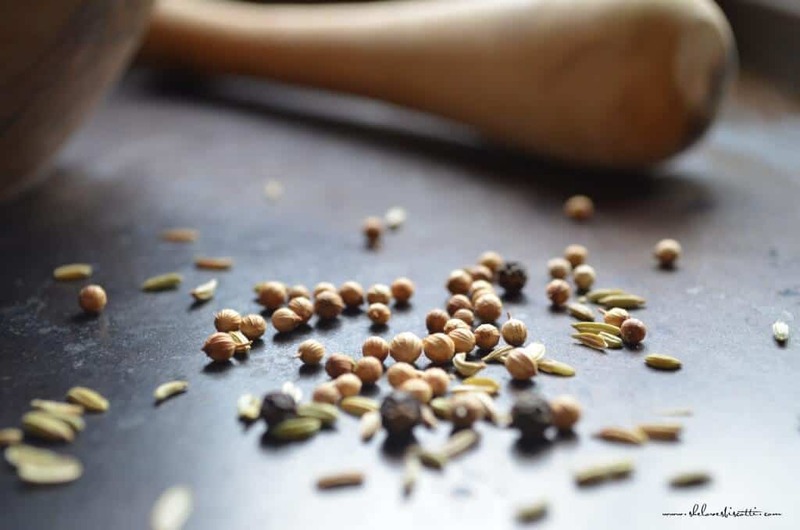 Crush the spices together with the help of a mortar and pestle (a pepper grinder also works). Rub 2 tablespoons of the olive oil over the entire chicken pieces. Rub the spices over the entire chicken, both over and under the skin. Place the seasoned chicken on the grill, close the lid and reduce the temperature to medium low. In the meanwhile, rub 1 tablespoon olive oil on the fennel wedges and place on the grill. Cook until tender, approximately 6-10 minutes, depending on the size of the wedges. Brush cut side of peaches with last tablespoon of olive oil. Place peaches (or apricots) cut side down on greased grill. Close lid cover and grill until peaches have softened, approximately 6-10 minutes, depending on the size of the peaches. Remove chicken, fennel and peaches from the grill and place on a large serving platter. Garnish with lime wedges, fennel fronds and chopped chives. Can’t wait to try this on the barbecue. Thanks Maria ! Wow! Another chicken recipe goes to my to-make list. Looks so good with those apricots! I do not use fennel nearly as often as I should, and this dish is screaming my name right now! I love the idea of slightly caramelized apricots to complement that perfectly seasoned chicken! This is what summer is all about 🙂 Thanks for sharing! Sound slike this magazine is amazing! Going to check it out now! I love that all the parts of the meal get a little love from the grill here. I was just enjoying some grilled peaches this evening and grilled apricots sound so tasty with the chicken and the fennel. Growing up, fennel was always paired with pork. Then I discovered Ricardo’s Thanksgiving Roasted Chicken! 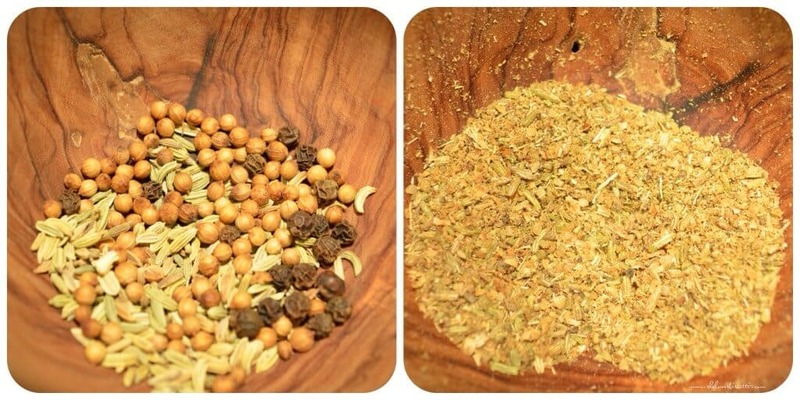 The spice rub is similar to this chicken recipe. The fennel scent as the chicken roasts is simply to die for! I can’t tell you what happens to my taste buds when I bite into this wonderful roast chicken…it’s a party in the mouth! And my kids love it! Can I ask for more? You must try it. Thanks Ricardo and Ciao Maria ? I absolutely agree! Appreciate the comment.